Discover the secrets of an ancient relic, and its deadly curse, using your Match 3 skills! Summon powerful lightning storms to help you clear the board, and uncover the truth behind this unknown artifact. Collect unique talismans with special powers as you progress. 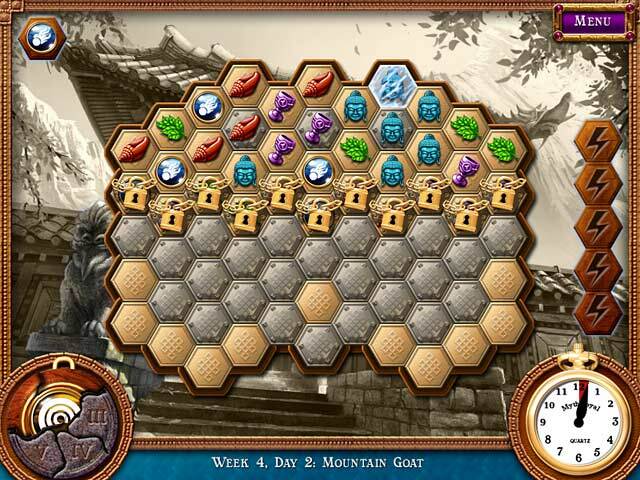 Travel all across Asia on your journey for a cure to your mysterious ailment, and figure out the dangerous Azkend! 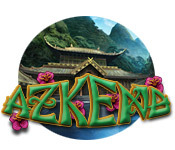 Remove the curse of Azkend! Azkend is rated 4.2 out of 5 by 13. Rated 5 out of 5 by fredandethel from Different match 3 which stands the test of time! I bought this game over 3 years ago, along with Azkend 2, and recently rediscovered it when looking through my Game Manager. It still looks original and beautiful - oriental scenes are gently washed with a section of colour at the end of each level. Timed, but still relaxing, apart from perhaps the very last levels where a change of Talisman may be needed to complete them. Rated 5 out of 5 by mrm2006 from Stunning and Relaxing Match 3. There is a storyline. Unfortunately, I was so captivated and mesmerized by the beautiful backgrounds and scenery that it slipped my mind. Graphics: Nothing overly bright nor overly cheerful looking. Muted colors, but appropriate for the game. If you play it, you'll get what I mean. Sound: When the background music started, I felt it was kind of a western sounding (like old cowboy music) but as it continued on it became strictly lilting, beautiful Asian music. Very relaxing. The sound effects were also appropriate for the game play. Nothing over the top with BOOMS and BLASTS just relaxing sounds. Game Play: You have to make match 3 or more of similar items on the game board by stringing items together. String 4 together and you'll get a bonus; string 7 or more together and you'll get a better bonus. Most bonuses activate themselves. Others you activate and will help you immensely. Even bonuses have to clear the board. 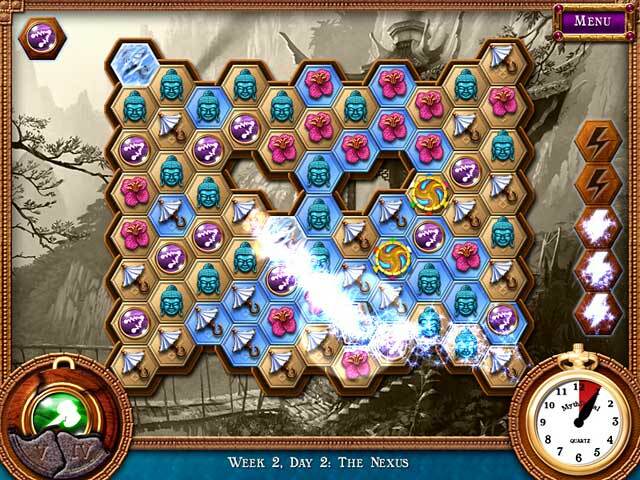 Once the board is cleared and turned all blue, there is an artifact piece that must get to the bottom of the game board by continuing to match 3 or more like items. This game follows a map by days. Week 1, Day 1; Week 1, Day 2. After one week of game play you have to find "visions" of the background scenery. Playing the game will explain better than I can, but it's really not hard. There appear to be a LOT of levels as you follow the path up a mountain backdrop. This game is timed. I was surprised because I didn't really notice that until I got a little extra bonus surprise that said the next 7 levels would have 7 seconds added to it. After 21 days, I only timed out once. Game Play does get harder as you level up. I was immensely surprised when my free hour was up and my initial reaction was "NO! NOT YET!" Because that is my personal "wow" factor. My indicator that this is a game I have to purchase. I strongly encourage everyone to try this game. The demo is a very quick hour and it's free. I'll just bet you get hooked too. Who knows, this might be a genre of game you never thought you'd like - like me -lol Happy Gaming! Rated 5 out of 5 by JENVOL from azkend AWESOME GAME!!! VERY ENJOYABLE. Rated 5 out of 5 by PaulaBrandon from Fun Match 3 Game I loved this game when played as free trial, however after purchasing it, the game will not activate. I purchased several games, and just hoping I don't have the same problem with the rest of them, when purchased, they were B1G1. Rated 5 out of 5 by Tassiegal from A great game! I enjoy M3 games and this one is a bit different - linking pieces in chains, rather than swapping, and a hexagonal board. The graphics and symbols used are lovely and the game play is absorbing. It gets pretty challenging at the highest levels (at least to me - I'm not the fastest player in the world!) and I haven't managed to get right to the end yet. I even like the music, tho' I turn off all the bangs, beeps and explosions. This is set to become one of my all-time favourites. Rated 4 out of 5 by Snowfoxx from Fun diversion Once again, we have been treated by Myth People to another great match 3 game, but I found Azkend to be to much like Heroes of Hellas. while the storyline was far different, as you are playing as an explorer searching for an artifact to cure your strange illness, the maze-like matching had you following little icons all over the hexagonal grid. While I did not mind the grid game itself much, the mini-game where you have to match parts of the background picture to itself was a bit frustrating, as it really did not lend to the game much, and some parts of you background looked to similar to each other. This was very much a right-brain part of the game, and I was happy to get back to the left brain part of it when the grids came back up. I did like the exotic setting of Tibet, and all the mountains, temples and high bridges. I also liked that I could earn new tools the further I went up in levels. While Azkend is no Heroes of Kalevala, it is a fun bit of a way to pass the time. The background music does not overpower, so you do not feel like you are playing a video game while dining in a Chinese restaurant, as it does with other adventure games set in Asia. It's a fun bit of diversion, plain and simple. 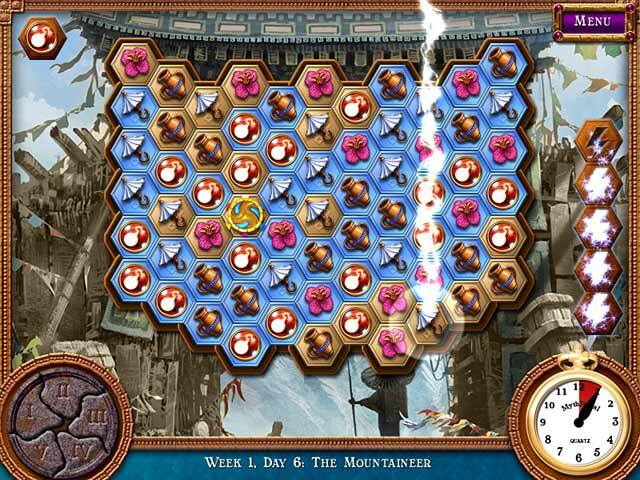 Rated 4 out of 5 by sereneorchid from An addictive chaining-style matching Azkend has a lot going for it, with wonderful graphics and animations, and a storyline that involves earning pieces of talismans that provide powerful explosions, lighting bolts, and other animated effects during the matching games. Instead of swapping icons, you click and hold your mouse button, and form chains of matching icons, which is easy (as long as there are icons to match! ), quick to play, and a lot of fun. The game play is also a little different in that instead of square tiles, they are hexagon-shaped, so the chaining goes off at angles instead of the usual horizontal and vertical directions, which requires you to think a little bit more. My only beef with the game, and the reason it lost a star, is that it has a timer that cannot be turned off. While I did well playing against the timer as the game got harder, and only had to repeat a few levels a few times, I just don't like the stress of playing against a timer. I would have bought the game if the timer were optional. Rated 4 out of 5 by Loftyhus from It's a gud un !!!!!!!!!!!!!!!!!!! Excellant game makes a nice change from normal match 3 games ??? Discover the secrets of an ancient relic using your Match 3 skills! Summon powerful lightning storms to help you clear the board.